PSP are Poles apart from average plug-in merchants and sQuad proves it. Sign up today for flavoursome equalisation! … But has some of their limits. PSP Audioware is held in high regard for its analogue hardware-inspired plug-ins and decidedly modern efforts such as the Xenon mastering limiter. Traditionally, it's shied away from cloning specific bits of hardware, thus avoiding comparisons with the real units. This time around, though, it's changed tack slightly, as for at least two of the units, it's taken a close look at iconic analogue hardware EQs and borrowed from their aesthetics, tonal qualities and even operational quirks. 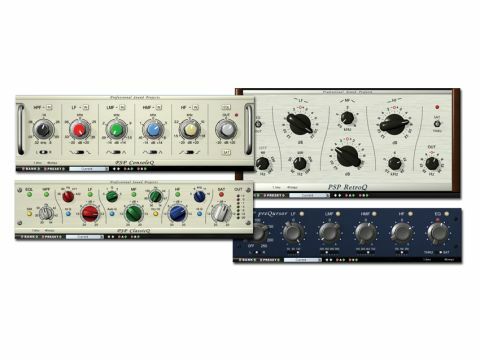 sQuad is a collection of four vintage-styled EQ plug-ins: ClassicQ, ConsoleQ, PreQursor and RetroQ. ClassicQ has low and high bands and a detailed mid-range control, and is more than reminiscent of a vintage Neve EQ in sound and operation. For closer Neve emulation, there's an Auto Q switch, which causes the Q of the mid band to increase progressively as the boost or cut is pushed further, giving a more subtle sound. Unlike the other plug-ins in the pack, ClassicQ boasts a Sim switch, which activates PSP's emulation of Class A circuitry and output transformer to further colour the sound. There's also a high-pass filter that goes right up to 4kHz. ConsoleQ is said to be based on a British Amek EQ and sports two mid-range bands, as well as high and low shelves, each with a switch for slope shape or band Q. Again, there's a high-pass filter, this time ranging up to 800Hz. Notably, ConsoleQ is the only sQuad EQ that allows fine-tuning of bands to specific frequencies. ConsoleQ and ClassicQ have the most noticeable sonic character of the lot, and while extreme settings can sound 'forced' on some material, this is also what makes them great when you need to colour a sound dramatically - to get a kick drum to really thud, for instance. PreQursor is described as PSP's own take on a custom-shaped, musical-sounding EQ, with low resonance peaks and excellent band separation. The high-pass filter goes up to 250Hz, and while the frequency knobs lock into discrete positions, there's enough detail for most applications. PreQursor has a clean sound, with no noticeable ringing, even with severe cuts and boosts. PSP say it's especially suited to acoustic material, but it's also ideal for treating harder sounds without them merely becoming harsh, such as cutting the mids on metal guitars. RetroQ is based on the same filters as PSP's revered VintageWarmer2, and we can certainly hear that. PSP claims that it's optimised for use on buses and full mixes, but we reckon this is selling it short. Like PreQursor, it's able to considerably brighten sounds up without them becoming harsh, and we particularly like it on cymbals. It features low- and high-shelving filters, a midrange band, and high-pass up to 240Hz. As distinct as they sound, all four of the sQuad EQs share some basic features. They all employ PSP's FAT double-sampling algorithm that kicks in automatically when the plug-ins are used at sample rates below 50kHz (ie, 44.1kHz and 48kHz). PSP claims that this is to ensure that the most accurate processing is always achieved. Similarly, the sQuad EQs employ double-precision 64-bit floating-point processing to avoid accumulative errors that might give sonic clues to the fact that these are actually digital effects. At the output stage of each plug-in is a saturation option, which has a rather pleasant character when driven. This is certainly one of the most welcome features, as it not only prevents clipping but adds a special character to the material passing through. It's worth using the saturation on sounds that needs beefing up, even if you don't use the EQ controls. sQuad offers a fantastic range of high-quality, character-oozing EQs. You might find the vintage-styled controls restrictive, but it's clear that these plug-ins are designed more for their sound than for ultimate flexibility. Still, in combination, there is enough flexibility to handle nine out of ten EQ'ing situations.